A tall, glabrous herb with fibrous roots, usually growing in dense clusters. Leaves mostly basal, linear, erect or spreading, 1 to 2 feet long and one-half to two-thirds of an inch wide, channeled and tapering to an acute tip. Flowering scapes leafless, 2 to 5 feet tall, bearing a few short bracts above, and six to fifteen flowers on short pedicels. Perianth funnelform, tawny-orange, 4 to 5 inches long, opening for a day, its lobes oblong, somewhat spreading, netted-veined, the three outer nearly flat and more acute; the three inner ones undulate on their margins and blunt. Stamens six, inserted at the top of the perianth tube, shorter than the lobes of the perianth and declined. Fruit an oblong, thick-walled, three-angled, wrinkled capsule. Native of Europe and Asia. Frequent in cultivation in this country and commonly escaped to meadows, along streams and roadsides or persistent in old yards and cemeteries. A flower of early introduction into the eastern states where it has made itself quite at home as an escape, and thrives and spreads with amazing rapidity under favorable conditions. 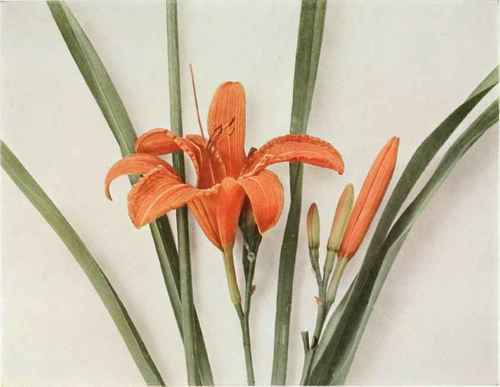 The Yellow Day Lily (Hemerocallis flava Linnaeus), with yellow flowers, their lobes parallel-veined, is occasionally found near old gardens and on roadsides, but not so frequently as the tawny-orange flowered Day Lily.